What: Author of the best-selling Gabriel McRay psychological thrillers. The two books so far in the series, THE DARK BEFORE DAWN and DEEP INTO DUSK have won 9 awards, among them Kirkus Reviews Best of 2011 and the 2014 IPPY for Best Mystery/Thriller. 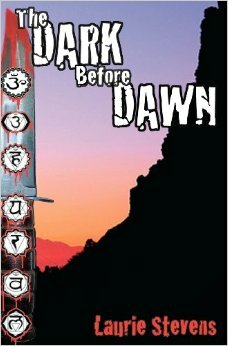 I just finished reading THE DARK BEFORE DAWN, the first Gabriel McRay novel. It was a real page-turner. What drew you to write a psychological thriller/suspense series like this? I wanted to bring out subjects that cause people to face their fears. I envisioned the protagonist, Gabriel McRay, as sort of an everyman character, needing to go on a psychological healing journey. Gabriel McRay is a deeply flawed character with a troubled past. Did you set out to write him with such an intricate back story, or did it evolve along the way? A little of both. I presented his character with a trauma, something that is way too prevalent in modern society unfortunately. Then I did a lot of research and interviewed professionals to help shape the direction of his psychological healing process. But every writer will tell you that the characters end up speaking for themselves. Gabriel is no exception. You deal with some dark themes and gruesome crime scene descriptions in your writing. Did you know that was something you were capable of before you wrote the first novel? Ha! No. I’ve always loved a good scary story, but I didn’t think I could tap into the dark side this deeply. I think my friends are no longer willing to meet me in a dark alley. What—if anything—did you write or publish before this series? I’ve co-written a stage play and a television special that were both produced (and other endeavors that never saw the light of day!) There have been short stories and many articles and posts that have been published, but this series is my first foray into novel writing and publishing. THE DARK BEFORE DAWN has a really strong sense of place, especially in the scenes set in Los Angeles. Why is LA the right location for this story? Why did you decide to bring San Francisco into the story? You are a Los Angelino, so you’ll know what a fabulous character this city makes. Gabriel McRay works the Santa Monica Mountain area. Where else can you find old movie sets and remnants of ancient Native American culture next to a metropolis that features celebrities, soccer moms, Skid Row, and people who run the gamut from shallow to Zen? Besides, it’s true that you should write about what you know, then what else can I write about? I’m 2nd generation Californian. 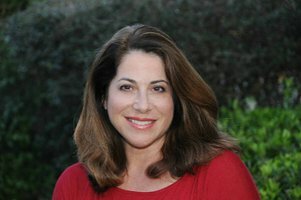 My mother was born and raised in Los Angeles. My father was born and raised in San Francisco—with his family there, so that city was a second home to me. The scenes in San Francisco are from my own memory. The second book in the series is DEEP INTO DUSK. How does this novel differ from the first one? How does Gabriel McRay evolve? Serial killers feature prominently in both of your novels. What kind of research did you do—if any—to get a sense for what drives them? I have pester ed psychiatrists and forensic investigators and they give me research material—books, articles and journals, plus their own opinions. WHY THEY KILL by Richard Rhodes is an interesting book and ALONE WITH THE DEVIL by Dr. Ronald Markman is quite possibly the scariest book I’ve ever read. What is the single most shocking thing you ever learned about a real-life serial killer? There’s a lot that is shocking. Much of the criminal activity in the Gabriel McRay books has been taken directly from actual crimes I’ve researched. I couldn’t make that stuff up. If I had to pinpoint one thing, it would be the way habitual murderers disassociate from other people. It’s like they’ve flipped off an emotional switch. Yes. In fact, the company has plans to publish two other authors! You recently signed with Blanvalet (Random House, Germany). How did that deal come about? Will they be publishing the whole series? They are publishing all the books so far. I look forward to them publishing many more of my books in the future. As to how it all came about, I ran a promotion that got both books onto the top 10 of Amazon thrillers. An agent at A.M. Heath in London took notice and I signed on with her for foreign rights. She sold the books and now THE DARK BEFORE DAWN (TODES SHULD is the German title) is coming out November 2015. DEEP INTO DUSK is due to come out 2016. If you could give new writers one piece of advice, what would it be? The best writing comes when you lay yourself bare. If you are writing to please an invisible judge, your words won’t ring true. What would you tell them to absolutely avoid on their path to publishing? Avoid your own ego. If you are self-publishing, don’t think that your first draft is perfect. Get Beta-readers, get content editors—oftentimes fellow authors will do you a favor. Then pay a copy-editor. Make your work as pristine as possible. After all, it’s going to have your name on it. When can we expect the third installment in the Gabriel McCray series? Funny you should mention the third book. It’s called THE MASK OF MIDNIGHT and features Gabriel’s nemesis, Victor Archwood. I have recently signed on with an agent in Los Angeles and he is shopping the book to top publishers as we speak. I am hoping the new book will be available to the public very soon. For the interim, can I ask you to brush up on your German? Thanks so much for the opportunity—this was a lot of fun! 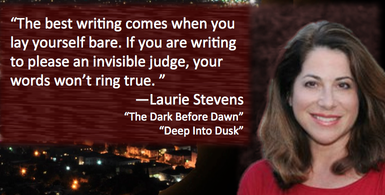 This entry was tagged #amreading, #amwriting, #author, #MondayBlogShare, #writetips, #writingtips, Deep Into Dusk, Gabriel McRay, interview, Laurie Stevens, los angeles, psychological, Q and A, The Dark Before Dawn, thriller. Bookmark the permalink.